Kids' Book Review: Review: Any Questions? 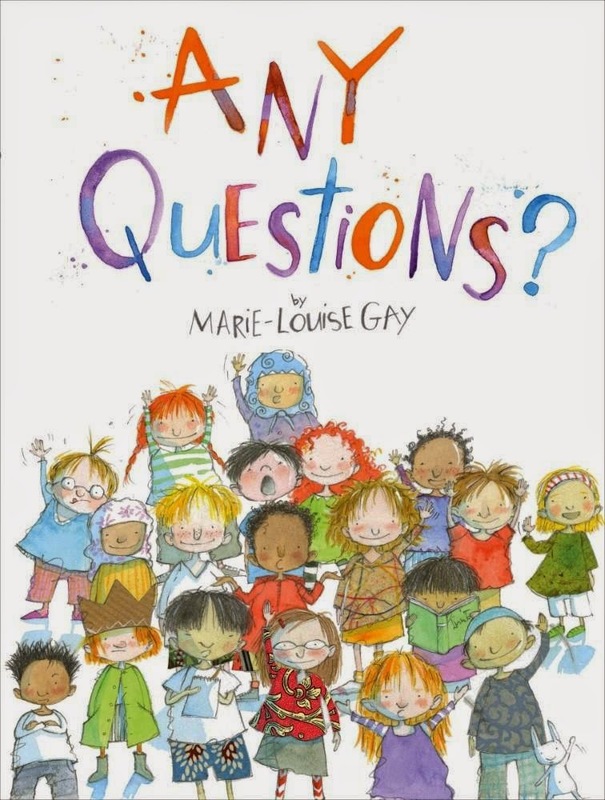 Marie-Louise Gay is an acclaimed author and illustrator of kids' books. Over the years, she's been amazed by the questions kids come up with about writing, drawing and how ideas develop into stories. So, in this picture book, she answers them! The result is a story within a story and a wonderfully creative adventure inside the mind of an author/illustrator! The book begins with the author remembering her own childhood, her curiosity and how she used to always be daydreaming. Not unlike the kids she meets on school visits now that she's a grown-up! She runs through a list of the questions she's often asked: Do you write from morning to night? Can you draw a horse? Do you like watermelons? Where do your ideas come from? And, perhaps the most important: Where does a story start? From then on, this delightful book is hijacked by the kids' questions. These are turned into story ideas which Marie-Louise Gay then illustrates. The white page is a snowstorm, then it's a polar bear in a snowstorm, then a penguin appears. From there, the kids questions jump to dinosaurs, and lo and behold, we're off flying with pterodactyls. This is a truly unique book. It's a fabulous exploration of creativity and how ideas can become stories. While younger kids will love the interactive aspect, older kids will hopefully also see how writing can be so much fun. Anything goes when you're creating; there's no right or wrong. It's all about discovering where ideas can take you and then slowly letting a story emerge.